Actress Sandhya Roy wiki profile biography life details, Sandhya Roy Birthday Address Mobile Phone Contact Number Actress Sandhya Roy Family Father Mother Wife Children Son Daughter Actress Sandhya Roy Qualification Educations School College Name Sandhya Roy professional Career Awards Achievements Actress Sandhya Roy Early Personal Secret Professional Educational Life works occupation Sandhya Roy latest news updates information. Legendary actress Sandhya Roy, born at Nabadwip (Nadia District of West Bengal), is known for her contribution towards Bengali cinema & sweet face during 1960 to 1985. In her long acting career, Sandhya Roy has acted in lead role, second lead character and also as supporting role successfully. She has worked with most of all legendary Bengali film directors & actors in her long professional life. 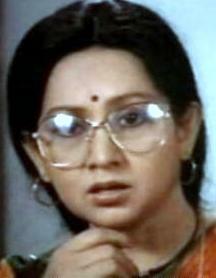 • Birthday of Actress Sandhya Roy: - 11th April 1945 or 1947. • Actress Sandhya Roy House Address: - Sandhya Roy was born at Nabadwip (Nadia, West Bengal) then moved to Bangladesh. Later in 1957 she came back to Kolkata and lived at Paikpara (North Kolkata). Now she is living at South Kolkata’s resident. • Actress Sandhya Roy Early Life & Family Background: - Sandhya Roy had born in Nabadwip [West Bengal] in 1945 or 1947. Even she is unable to confirm the year. The early life of actress Sandhya Roy wasn't a smooth ride & full of sufferings. After her birth, parents moved to their parental house of Bangladesh. Sandhya Roy's grand-father was a landlord in Bangladesh, where her parents moved after she born. Sandhya Roy started living there with her parents, brothers. At the age of 7 and 9, Sandhya Roy lost her mother and father respectively. After the loss of parents, Sandhya Roy went to 'Mama Bari' at Khulna (Bangladesh). In 1957, she came to Kolkata with her maternal uncle and started living at Paikpara area of North Kolkata. Because of the financial condition the educational life was fully stopped during her school days. Actress Sandhya Roy & Director Tarun Majumdar married on 21st July 1967. It was a love marriage. They have no child. • Occupation of Sandhya Roy: - Actress. • Professional Life Works of Actress Sandhya Roy: - It was in 1957, when Sandhya Roy used to live at Paikpara area of North Kolkata, she went with other local girls to do the shooting of crowd in the Radha Studio of Kolkata. Pashupati Chattopadhyay directed 'Mamlar Fol' Bengali film was the first ever film where Sandhya Roy has been seen as a crowd. Rajen Tarafdar's Antariksha was the second film of Sandhya Roy. One by one she was receiving offers from directors and started showing her skills on screen. Later on, she has done films with world famous director Satyajit Roy & Tarun Majumdar as well. Few notable Films of actress Sandhya Roy are - Arohon (2010), Maa Amar Maa (2009), Nabab Nandini (2007), Ekai Eksho (2006), Debipaksha (2004), Ram Lakshman (2004), Tantrik (2002), Prem Pratigya (2001), Jamai No.1 (1998), Tarini Tara Maa (1997), Satya Mithya (1992), Nabab (1991), Path O Prasad (1991), Sajani Go Sajani (1991), Gharer Bou (1990), Mahajan (1990), Mangaldeep (1989), Monimala (1989), Agaman (1988), Chhoto Bou (1988), Parashmoni (1988), Punarmilan (1988), Dolanchanpa (1987), Lalan Fakir (1987), Nagpash (1987), Achena Mukh (1986), Parinati (1986), Pathbhola (1986), Harishchandra Shaibya (1985), Tagari (1985), Amargeeti (1984), Agradani (1983), Khelar Putul (1982), Mamata (1982), Meghmukti (1982), Pratiksha (1982), Khana Baraha (1981), Shahar Theke Dure (1981), Raja Saheb (1980), Darpachurna (1980), Baba Taraknath (1980), Dadar Kirti (1980), Sita (1980), Ganadebata (1979), Dhanraj Tamang (1978), Golap Bou (1978), Karunamoyee (1978), Nadi Theke Sagare (1978), Saat Bhai Champa (1978), Ei Prithibir Panthanibas (1977), Harano Prapti Niruddesh (1977), Kabita (1977), Arjun (1976), Palanka (1975), Sansar Simante (1975), Phuleswari (1974), Thagini (1974), Ashani Sanket (1973), Agnibhramar (1973), Ami Sirajer Begam (1973), Chithi (1973), Sreeman Prithwiraj (1973), Bandagi (1972), Kuheli (1971), Nimantran (1971), Rupasi (1970), Aparichito (1969), Arogya Niketan (1969), Dadu (1969), Rahgir (1969), Tin Adhyay (1968), Baghini (1968), Jiban Sangeet (1968), Hathat Dekha (1967), Prastar Swakshar (1967), Monihar (1966), Natun Jiban (1966), Uttar Purush (1966), Suryatapa (1965), Alor Pipasa (1965), Antaral (1965), Ektuku Basa (1965), Pratham Prem (1965), Tapasi (1965), Agnibanya (1964), Jiban Kahini (1964), Kashtipathar (1964), Ke Tumi (1964), Pooja Ke Phool (1964), Tahole (1964), Bhrantibilas (1963), Barnachora (1963), Dwiper Naam Tiya Rang (1963), High Heel (1963), Palatak (1963), Aamar Desh (1962), Agun (1962), Asli Naqli (1962), Badhu (1962), Bandhan (1962), Dhupchhaya (1962), Kumari Mon (1962), Nabadiganta (1962), Rakta Palash (1962), Shasti (1962), Shesh Chinha (1962), Shubho Drishti (1962), Sorry Madam (1962), Jhinder Bandi (1961), Ahwan (1961), Arghya (1961), Kathin Maya (1961), Pankatilak (1961), Mayamriga (1960), Dui Bechara (1960), Ganga (1960), Jal-Jangal (1959), Nrityeri Taletale (1959), Sree Sree Nityananda Prabhu (1959), Brindaban Lila (1958), Kangsa (1958), Nagini Kanyar Kahini (1958), Antariksha (1957), and Debut Movie Mamlar Fol (1957 – as a crowd member) etc. • Awards won by actress Sandhya Roy: - Actress Sandhya Roy has won Best Actress Award in BFJA Awards for Nimantran (1972) and for Sansar Simante (1976) twice. She also received Best Actress in a Supporting Role award in BFJA Awards for Tin Adhyay film (1969). West Bengal Government awarded her with Special Chalachitra Puraskar in 2012. Good wishes to Actress Sandhya Roy for upcoming life & Career from the team of Kolkata Bengal Information. We all are looking for more good jobs from you (Actress Sandhya Roy), so keep on doing your best work for us.